We’re not a stranger to Phiaton’s line of audio products, which range from in-ear headphones to premium over-the-ear styles. This particular time, however, we’re checking out another pair of in-ear headphones – the Phiaton PS 202 NC. Sporting Phiaton’s unique styling, the PS 202 NC is a wired set that’s arguably most notable for its noise-cancelling feature and 14.3mm drivers. Phiaton’s line of headphones tend to favor a more aggressive styling, which is again evident here with the PS 202 NC. The ear buds themselves show that, since they’re pronounced and have no disregard to letting folks know that there’s something in our ear. However, they’re not like your traditional in-ear pair, especially when there are microphones incorporated into the metal accent compartment of each ear bud – as well as the larger-than-normal size in-line remote towards the middle. At first, we were a bit skeptical by this design choice, since we believed that the oddly placed in-line remote appeared weighty because of its size. Thankfully, though, that’s not the case because it’s quite hollow – allowing it to feel lightweight. Paired with its silicone ear tips, or the included foam tips, the ear buds stay firmly in place and feel quite comfortable to use for a couple of hours. The middle in-line remote compartment houses a microUSB port behind a plastic cover, which charges the internal battery. It’s required to enable its noise-cancelling feature, which is activated when moving the switch to the appropriate side. Nearby, there’s a multi-function button that acts as the pause/play function with music listening – while double and triple pressing it achieves the track forward and reverse functions. And finally, a tiny sized “ monitor” button is there to mute whatever is being outputted through the earbuds, so that ambient sound is amplified to permit us to hear our nearby surroundings. Powered by 14.3mm drivers, the Phiaton PS 202 NC also packs an optimized vibration system that focuses more on high frequency clarity. Honestly, the result here is crisp and clear tones in the higher frequency ranges – while lows are still backed with a decent amount of presence. It’s not as bass-heavy as some other pairs we’ve reviewed, but the great thing here is that it doesn’t strain or struggle at any point. 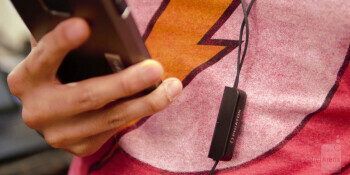 Enabling noise-cancellation, there’s no degradation or change with its audio quality, but of course, we can hear background noise being suppressed. Now, it doesn’t totally cancel them out (about 95% actually), but it’s enough to reduce the sound of wind moving while you’re in an airplane. On rare occasions do we find in-ear headphones offering any sort of noise-cancelling, so it’s humbling to know that it’s available with the Phiaton PS 202 NC. At the same time, too, it doesn’t disappoint in the audio quality department either. With its $119 price point, some folks might raise a few brows thinking it’s an expensive investment, but we beg to differ because we’ve checked out other comparably priced in-ear headphones that don’t offer noise-cancelling. This isn’t the kind of thing we’d recommend for active individuals, but rather, for those who prefer to chill out and just relax.